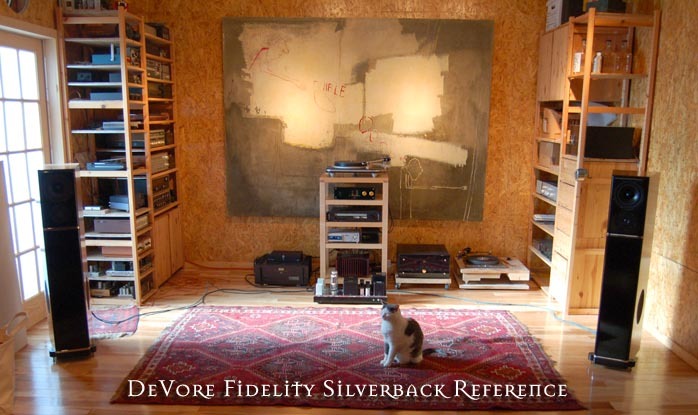 John DeVore of DeVore Fidelity has built himself a room. Actually, it's a room within a room. The surrounding room is where building takes place; building loudspeakers to be precise. This new room within the old room is part of a beautiful old building which is part of the Brooklyn Navy Yard where the military once built things. Now these rooms -- and the building and listening going on within them -- are concerned with music. Welcome to the Monkeyhaus. Just like that tree (not the one in Brooklyn, the other famous one), what good is a room meant for music if no one is listening? 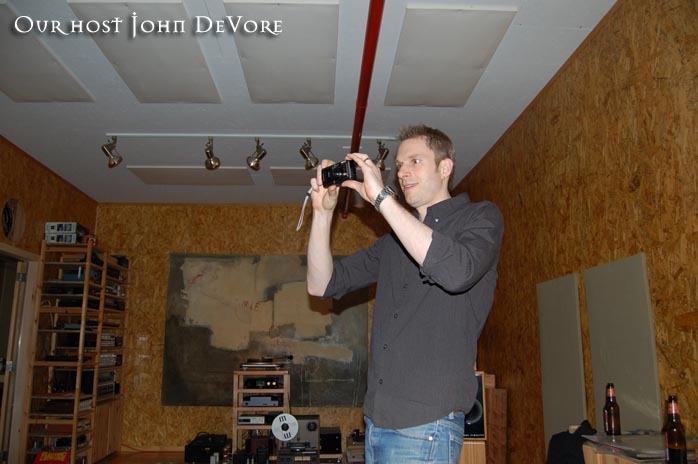 Monkeyhaus was built as John DeVore's office but also with listening and parties in mind. Parties for listening. I'd imagine there can be any number of reasons to have a Monkeyhaus listening party -- it's Thursday gets my vote -- but so far, the first two have been inspired by the short-term availability of some gear and the third to hear the new DeVore 3XL speakers. 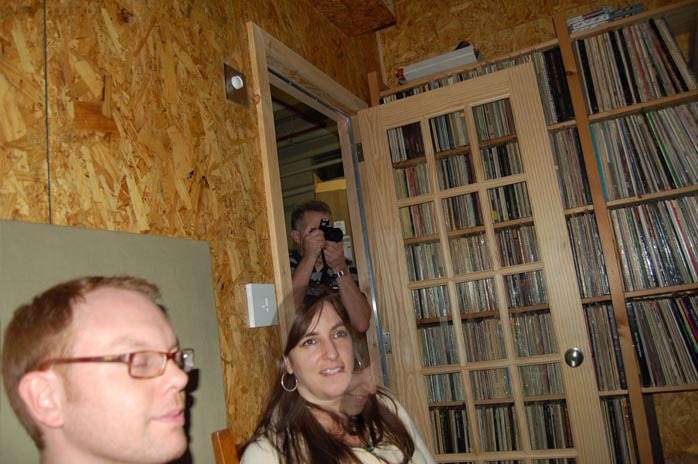 The first-ever Monkeyhaus listening party took place in late January of 2009. We were able to take advantage of the opportunity to hear some of the components that were used in the DeVore Fidelity room at this year's CES before they were shipped back to their respective manufacturers. These included the Nagra PL-L line stage, Nagra VPS phono stage and the Spiral Groove SG-2 turntable. The rest of the system for Monkeyhaus I was the property of DeVore Fidelity and included an EMT 997 tonearm and EMT TSD-15 cartridge all sitting on the beautifully woody Box Furniture rack; and the Audio Note P3 Silver Signature amp, a single-ended 300B-based stereo affair that puts out 8 watts into the DeVore Fidelity Silverback Reference speakers. No one brought, mentioned or missed a compact disk. Maybe that's because the Monkeyhaus is big enough to fit plenty of full-size disks. The Who's Who for Monkeyhaus I included John DeVore, Jonathan Halpern of Tone Imports, Stephen Mejias of Stereophile, Andrew Klein, Ken Micallef of 6moons and Hieu Pham. 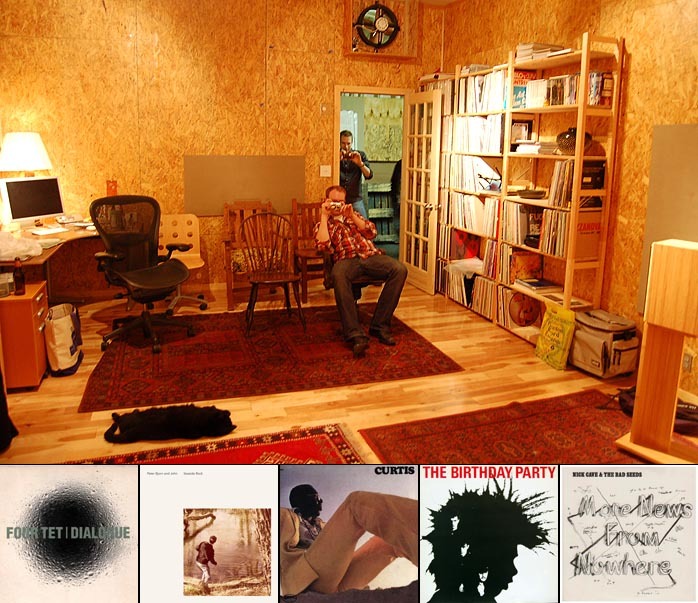 For an informed scoop on this event, read Stephen Mejias' An Investment in Soul on his Stereophile blog (that's him below listening blissfully). While we were undoubtedly listening to a hifi, music was the star of this party. You cannot listen to soundstages, midbasses or even frequency extensions at the same time as hearing PJ Harvey, The Budos Band and Bongo Joe. Nope, can't be done simultaneously. It's one or the other. I was so completely satisfied listening to PJ Harvey, The Budos Band and Bongo Joe, you're not going to get much out of me in terms of the other stuff. Since I'm emphasizing music to the detriment of audiophile chivalry, I thought I'd include some of the actual tunes we listened to at Monkeyhaus I, II and III at the end. I also believe as we look and listen to future Monkeyhaus events, we won't be seeing many musical duplicates. No reference tracks allowed would be my motto. I'd also guess there won't be many back 'n' forths, i.e. endless repetitions of the same track over and over to discern difference. Monkeyhaus II occurred exactly one week after. This time we were treated to a change in both pre and power amplification. Nori Komuro brought along his prototype Single-Ended 845 Stereo Amplifier and the Nagra gear was replaced by John DeVore's Shindo Monbrison full function preamplifier. Listeners included John DeVore, Jonathan Halpern, Komuro, Andrew Klein, Anthony Abbate of Box Furniture Co, Hieu Pham and Kaleb Abdi. Regular 6moons readers will have read about Komuro in these pages before. I've written a brief profile and two Road Tours where we listened to Komuro's WE212e monoblocks and his VT-52 Stereo amplifier. 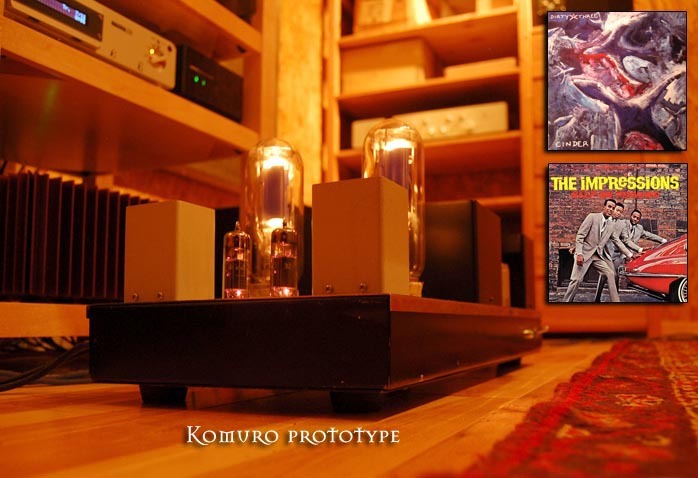 The Komuro prototype Single-Ended 845 Stereo Amplifier used a pair of 6BM8/ECL82 (a triode/pentode) to drive the direct-coupled 845s (Shuguang 845As in this case). The power and output transformers in the prototype were from Tango but the production version will use custom-made hand-wound transformers. Point-to-point wiring is employed throughout and output power is 20 watts per side.